Does the Bathroom Fan Do Anything? Other than make noise, that is. 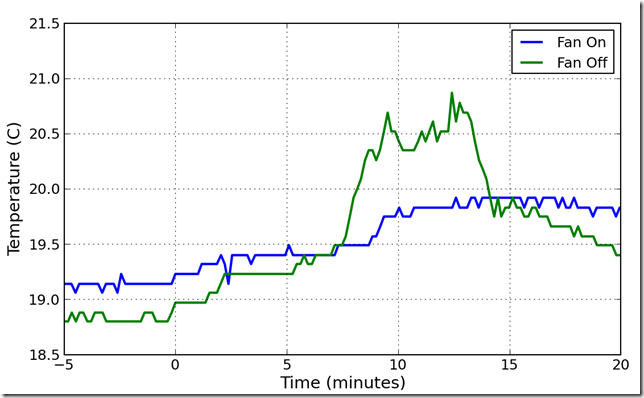 I built the most recent version of my Arduino-based data logger (the RIMU), and was looking for something to log. 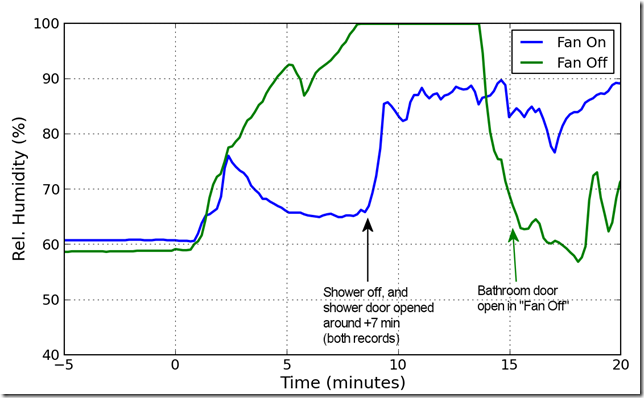 I’ve had this question for many, many years—does the bathroom fan actually do anything? It makes noise, deafening Niagara falls thundering noise. The mirror still gets foggy, though, and condensation still forms on the fixtures. Is there something good about all that noise? Investigating this with the RIMU is more difficult than you might think. First, it is hard to control the variables. I recorded about seven days’ worth of data before I got two records that had similar enough baselines to separate the effects of the fan. Second, the analysis had so many measurements to work with. Our bathroom is modest in size, with a counter and sink on one side and the shower on the opposite. The RIMU was sitting on the counter. The plot below shows the relative humidity over time. At approximately time zero I turned on the light. Shortly thereafter I turned on the shower, and the humidity began to rise. Weirdly, the humidity rose in a very similar fashion for the first few minutes. Probably the separation is when I climbed into the shower. 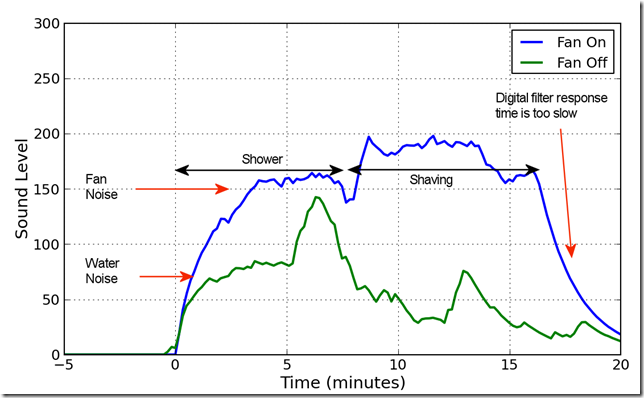 I speculate that the dip at six minutes in the green “fan off” curve is climbing into the shower too. 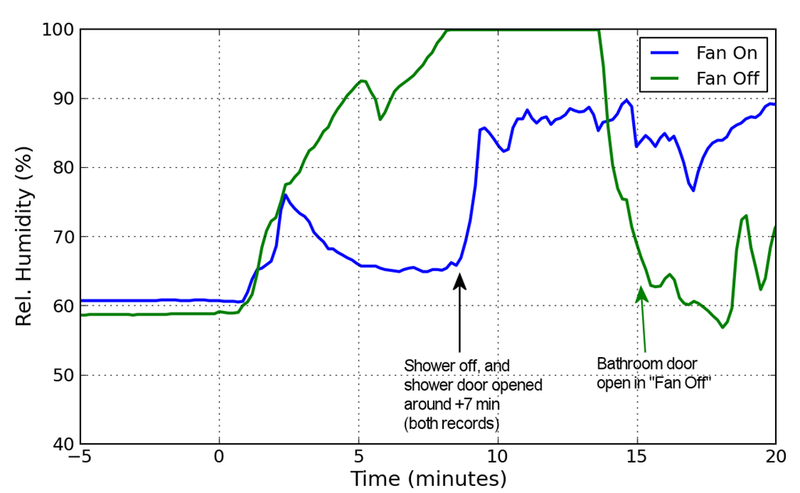 Opening the shower door, it seems, sets up different air currents. One conclusion, clearly, is that the fan actually keeps the humidity under about 90%, instead of letting it rise to 100%. Another conclusion is that, compared to leaving the bathroom door open, the fan is really ineffective. 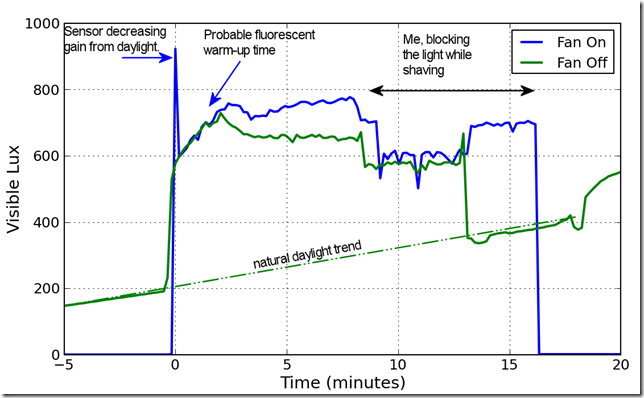 A third conclusion is that the sound and light data are actually more interesting than the humidity data. The TSL chip that I use to sense light is quite a wonderful little device. It has controllable integration time. The idea is that if it there is a low light level the sensor can record longer to provide a better estimate of the actual level. In the RIMU I try to auto-tune the integration time. If the reading is very low, I increase the integration time, if it is very high, I decrease it. Unfortunately, when I programmed the RIMU I did not realize that the TSL library was providing measurements that had to be corrected for the integration time (counts, not Lux). That brings us to the first interesting observation. In the blue “fan on” trace, there is a really whopping spike in the light level. What is actually happening is that there is a recorded measurement before the TSL integration time is reduced. The second cool observation is that you can see the fluorescent lights increase their output as they warm up. I knew, intellectually, that this was happening—my scanner won’t scan until its fluorescent tube has warmed up. I always thought that was a 20 second process, not a three minute process. The third cool observation is the visible background in the green “fan off” line. 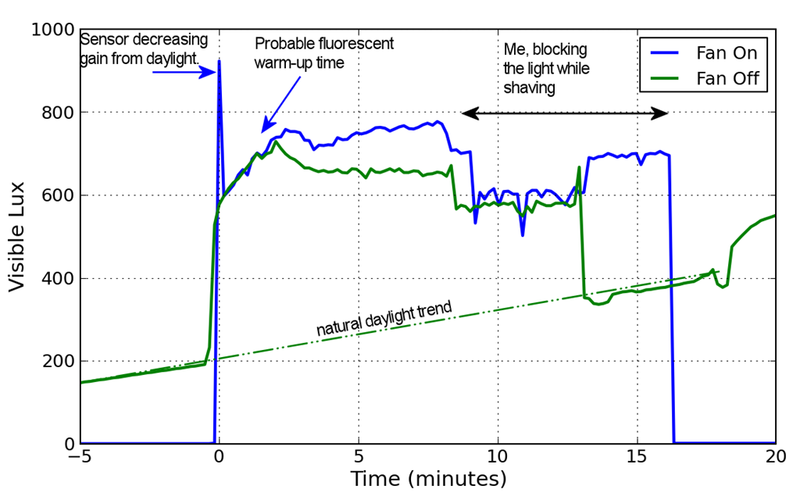 I took that recording on a Saturday morning, and the natural daylight trend is visible in the background. The first observation is that the moving average is not very cleverly implemented. The response time is nearly 3 minutes—something like 10 seconds would have been better. The second interesting thing to observe is how unimaginably loud the fan is. The fan more than doubles the sound level compared to the water flow. 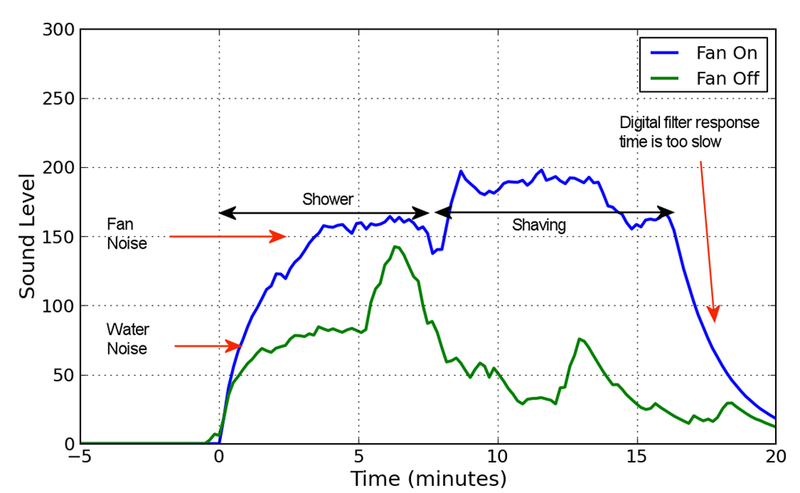 The noise during shaving is due to turning on the faucet, which was very close to the RIMU. The temperature in both trials increased an average of about 2 degrees Fahrenheit. 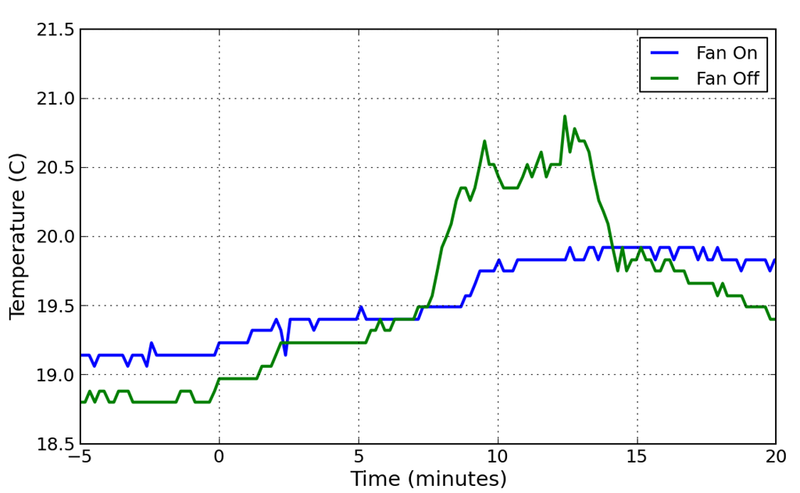 The fan may provide some mixing of the air, that keeps the temperature more even—the blue “fan on” line rises much less than the green line. Yep. The fan does something. If controlling humidity is really important (is it?) then you should just leave the door open. If you can’t leave the door open, turn on the fan. Posted on April 26, 2013 Categories MakingTags Electronics, Technology6 Comments on Does the Bathroom Fan Do Anything?